These healthy, vegetarian sandwiches are packed with so much goodness! French green lentils, cucumber, avocado, and a walnutty, herby ricotta cheese. The BEST lentil sandwiches! Hello friends! It’s time for another recipe for The Recipe Redux! This month, they asked us to create healthy, packable lunches. Lunches that are unique, and of course, good for you! So…… enter the awesome french green lentil as a main sandwich ingredient. 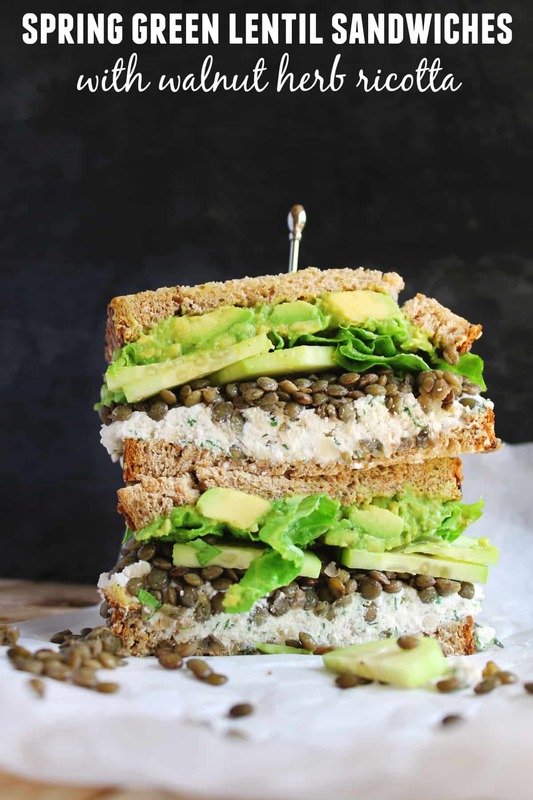 Add some Spring veggies, herbs, and some delicious cheese, and you’ve got the most awesome Spring green lentil sandwiches for lunch. Rinse the lentils in a mesh sieve under cold water. Remove shriveled lentils and any debris or pebbles. Combine with the stock in a small saucepan. Bring to a boil. Reduce heat, cover, and cook for 20 minutes, or until lentils are tender, but still a bit al dente*. Strain through the strainer and set aside. Meanwhile, stir together the ricotta with the dill, chives, and walnuts. Set aside. Build your sandwich! Spread the ricotta evenly over 2 pieces of bread, and the mashed avocado evenly over the other 2 pieces of bread. Season the avocado generously with salt and pepper. Top the ricotta with the lentils**. Top with the cucumber, lettuce, and then close with the avocado bread. *Keep an eye on the stock level. You may need to add more stock as the lentils cook. **You may have more lentils than you need. Reserve for another use. I definitely recommend wrapping this sandwich in parchment paper for packing. Those lentils can get EVERYWHERE! Also, why not make a big batch of those delicious lentils and keep them in your fridge. Add them to salads, soups, or use them as a side dish! Want more healthy, packable lunch ideas? Check out these recipes from other Recipe Redux members! OK guys. There’s a very special Vitamix giveaway coming your way THIS SUNDAY! Stay tuned! That sandwich looks incredible! Love the sound of the walnut herb ricotta. Yum! This sounds AMAZING! I love lentils, but that walnut herb ricotta is what is making me DROOL! I need to try this! Ha! Thanks! It definitely makes this sandwich! This is absolutely ingenious, and absolutely GORGEOUS too! Yep, definitely convenient for a packed lunch! Lovely pictures! I would eat this for lunch any day! Love the addition of lentils. And I currently have chives and dill coming up in my garden, so saving this to make soon! I would not have dreamt of putting lentils in a sandwich like this. I love the idea and will be borrowing it. I love the stacked sandwich picture – looks so yummy. That is a healthy looking sandwich right there! Sounds very healthy and nutritious. What a healthy n delicious sandwich is this. I love using lentils on a daily basis and this is surely going in my ‘things to make’ list. Great Molly! Let me know what you think! This sounds delicious! I love lentils on anything.. I hadn’t thought of putting them in a sandwich!! Thanks Sarah! You should give it a try sometime! Absolutely GORGEOUS!!! Definitely making this ASAP! Looks delicious! Haven’t had lentils on a sandwich before…what a great idea. First off, I LOVE your blog name, and promise of extra boozy drinks! And I want to spread that herby ricotta on everything and anything. Can’t wait to check out your blog even more now that I found it through Recipe Redux! Haha! Thanks! I’m VERY pregnant right now, so no boozy drinks this Spring, but they will be back this Summer for sure! YESSS!! Since I’ve been trying to eat less (or no) meat right now, I’ve found myself LOVING lentils!! Definitely trying out this recipe. Yum! These look so good and filling.